I pretty regularly watch videos in the Booktube community and I've been seeing a lot of videos in which a vlogger basically goes through their Goodreads account and compares the books they've given high ratings, but that Goodreads has low ratings for. I love watching these because it's so interesting to me to see what books randomly have lower average ratings compared to something that someone loves. It just goes to show that it's all about personal preference in the end, right? I've been curious about this myself, so I decided to give it a go and find out! For 'low,' I'm basically go with any rating 3.5 or lower. I know 3.5 isn't that low, but it's on the lower side compared to a lot of the usual ratings. So without further ado, let's begin! I read this as a freshman in high school and it just hit all the right notes for me. I'm honestly a bit surprised it has such a low rating just because it is a regular classic that I thought was fairly well-liked, but apparently Goodreads readers disagree. "Set at a boys boarding school in New England during the early years of World War II, A Separate Peace is a harrowing and luminous parable of the dark side of adolescence. Gene is a lonely, introverted intellectual. Phineas is a handsome, taunting, daredevil athlete. What happens between the two friends one summer, like the war itself, banishes the innocence of these boys and their world." What!? I'm assuming this is in large part due to the writing style and/or complete bleakness of the story. This book isn't for everyone, but it also seems incredibly popular, so I'm a bit shocked here. "It is the richest empire the world has ever known, and it is also doomed. Governed by an imposturous emperor, decadence has blinded its inhabitants to their vulnerability. The Yellow Empire is on the verge of invasion--and only one man can see it. Haunted by prophetic dreams, Orhan has hired a company of soldiers to cross the desert to reach the capital city. Once they enter the palace, they have one mission: kill the emperor, then all those who remain. Only from the ashes can a new empire be built." This was so, so beautiful and I was completely captivated by the story. I thought this book went over well and was fairly popular, but apparently not for some people. I still recommend it when I can. "Lilliet Berne is a sensation of the Paris Opera, a legendary soprano with every accolade except an original role, every singer’s chance at immortality. When one is finally offered to her, she realizes with alarm that the libretto is based on a hidden piece of her past. Only four could have betrayed her: one is dead, one loves her, one wants to own her. And one, she hopes, never thinks of her at all." If you like those dark college/boarding school books that feature a group of friends and some weird, messed up stuff like The Secret History, then this is that book. I thought it was really clever and interesting, so 3.2 is really surprising to me. "It was only ever meant to be a game played by six best friends in their first year at Oxford University; a game of consequences, silly forfeits, and childish dares. But then the game changed: The stakes grew higher and the dares more personal and more humiliating, finally evolving into a vicious struggle with unpredictable and tragic results. Now, fourteen years later, the remaining players must meet again for the final round. Who knows better than your best friends what would break you?" I can sort of understand some of the reviews that say this book dragged because it did at points, but it was also a neat idea that I think Bowling executed really well. I feel like it's more somewhere between middle grade and young adult, because I'm not sure middle grade readers would be as into it, but I really enjoyed it! "It's 1577. Queen Elizabeth I has imprisoned scheming Mary Queen of Scots, and Alyce's mother is burned at the stake for witchcraft. Alyce kills the witchfinder and flees to London - but the chase isn't over yet. As she discovers her own dark magic, powerful political forces are on her trail. She can't help but wonder: why is she so important? Soon she finds herself deep in a secret battle between rival queens, the fate of England resting on her shoulders..."
Okay, so I do understand why this might be less popular because the writing style is a bit odd and is likely the reason why Maguire is such a hit/miss author for people. "In this imaginative novel rooted in the rich soil of early-nineteenth-century German Romanticism, beloved New York Times bestselling author Gregory Maguire twins an origin legend of the famous Nutcracker with the life of Drosselmeier, the toymaker who carves him." This one's not as low as others on this list, but I still think it should be higher! This book would have been closer to a five-star read for me if the ending hadn't been so disappointing. I love a good horror novel, and this was so delightfully creepy. "When Silla and Nori arrive at their aunt's home, it's immediately clear that the "blood manor" is cursed. The creaking of the house and the stillness of the woods surrounding them would be enough of a sign, but there are secrets too--the questions that Silla can't ignore: Who is the beautiful boy that's appeared from the woods? Who is the man that her little sister sees, but no one else? And why does it seem that, ever since they arrived, the trees have been creeping closer?" Sarah Waters is incredible, and this book captivated me so easily. I loved the very subtle build-up to the later events and all the twists and turns that occurred. "It is 1922, and London is tense. Ex-servicemen are disillusioned; the out-of-work and the hungry are demanding change. And in South London, in a genteel Camberwell villa...life is about to be transformed as impoverished widow Mrs. Wray and her spinster daughter, Frances, are obliged to take in lodgers. Little do the Wrays know just how profoundly their new tenants will alter the course of Frances’s life—or, as passions mount and frustration gathers, how far-reaching, and how devastating, the disturbances will be." This isn't necessarily the next great novel, but it had a strong premise with interesting characters, so I'm surprised it's not more highly rated. I guess I don't read a lot of mystery-type books like this, so maybe compared to others it's not as good? Who knows-- I enjoyed it! "London, 1850. In the gaslit world of Dickens, Charles Maddox had been an up-and-coming officer for the Metropolitan police until a charge of insubordination abruptly ended his career. Now he struggles to eke out a living by tracking down criminals. To his shock, Charles has been approached by Edward Tulkinghorn, a shadowy and feared attorney, who offers him a handsome price to do some sleuthing for a client. But what starts as a simple case swiftly escalates into something much darker, as Charles cascades toward a collision with a dangerous and unspeakable truth." I remember reading an ARC and thinking this was a very interesting story that other people would like... and boy, was I wrong! Almost everyone I saw who read this thought it was some of her worst work and didn't like it much at all. Apparently my opinion was really off-base here, but... I still think it's interesting. "Stan and Charmaine are a married couple trying to stay afloat in the midst of an economic and social collapse. The Positron Project in the town of Consilience seems to be the answer to their prayers. No one is unemployed and everyone gets a comfortable, clean house to live in . . . for six months out of the year. On alternating months, residents of Consilience must leave their homes and function as inmates in the Positron prison system. But when Charmaine becomes romantically involved with the man who lives in their house during the months when she and Stan are in the prison, a series of troubling events unfolds, putting Stan's life in danger. With each passing day, Positron looks less like a prayer answered and more like a chilling prophecy fulfilled." I love a good Anne Boleyn story and I thought that this one was written extremely well and in a beautiful style. I feel like historical fiction is so oversaturated with Anne Boleyn books, though, that a lot just get buried amidst the rest. Regardless, I still liked this one a lot and recommend it to my fellow historical fiction fans. "In The Queen of Subtleties, Suzannah Dunn reimagines the rise and fall of the tragic queen through two alternating voices: that of Anne herself, who is penning a letter to her young daughter on the eve of her execution, and Lucy Cornwallis, the king’s confectioner. An employee of the highest status, Lucy is responsible for creating the sculpted sugar centerpieces that adorn each of the feasts marking Anne’s ascent in the king’s favor. They also share another link of which neither woman is aware: the lovely Mark Smeaton, wunderkind musician—the innocent on whom, ultimately, Anne’s downfall hinges." I'm a huge Alice fan and regularly collect different versions of the book, so this book was one I was skeptial about---but I thought it was great! It's a bit on the slower side, but I still am surprised it's not more highly rated. "Part love story, part literary mystery, Melanie Benjamin’s spellbinding historical novel leads readers on an unforgettable journey down the rabbit hole, to tell the story of a woman whose own life became the stuff of legend. Her name is Alice Liddell Hargreaves, but to the world she’ll always be known simply as “Alice,” the girl who followed the White Rabbit into a wonderland of Mad Hatters, Queens of Hearts, and Cheshire Cats. Now, nearing her eighty-first birthday, she looks back on a life of intense passion, great privilege, and greater tragedy." Have you read any of these books? If so, what'd you think? Do you love any unpopular books? Let me know! What a great post! I saw something like this on another blog, and I'm going to do a similar post in a couple weeks. I really enjoyed The Paying Guests. I agree that Maguire is a hit-or-miss author. Ooh, I'm really looking forward to your post now! And The Trees crept In was one I was definitely interested in! In spite of the ending I will probably get that one, it sounds so delighfully creepy ha ha! Haha well I hope you like it if you do pick it up! I really thought it was a great book! 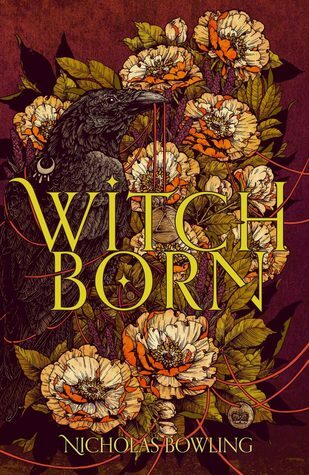 I am so excited to add the Anne Boleyn story and Witchborn to my TBR list. I love historical fiction especially that time period. I love this idea! I might have to steal it. Except, I usually rate books lower than the average on Goodreads. I’m a hardass reviewer. Black Chalk sounds amazing. I might have to add that one to my TBR list. I’m one of the people who hated The Heart Goes Last. I’ve read almost all of Atwood’s books, and that one was just too weird for me. Definitely steal it! I think being a hardass reviewer might just make it even more interesting, haha. Black Chalk really was great, I'm always surprised more people haven't read it. Yeah, I think The Heart Goes Last was actually the first Atwood book I ever read (I'm a late Atwood-discoverer), so maybe that's why I liked it while most Atwood fans didn't, haha. I haven't read any of these, but The Queen of the Night is on my TBR pile. Glad you enjoyed it so much! It's such a beautifully written story, I really hope you love it when you have a chance to read it! I haven't read any of these but The Trees Crept In is on my wishlist!! I also have the author's first book which I need to get to haha. (So annoying that the ending is a let down right?!) I find most books on Goodreads are rated like around the 3 star mark as the average, though, right?? But it's weird when I go through my friends' reviews and everyone is nearly opposite to mine. 😂 Reading is so subjective haha! I have read A Separate Peace, and I thought it was a fantastic book! It was kind of depressing, but it was so well written, and the characters felt so real- that's what made it so heavy. I have't read any of these other books. The Tiger Rising is in my opinion an amazingly beautiful book, but it looks like the Goodreads average is 3.79? (I don't really use Goodreads, but I think I'm doing this right.) And Lord of the Flies only got 3.65! This is fun. Oh my, The Maze Runner and Divergent got a higher rating than both these books. That's just not right. Great post! I'm glad other people have unpopular opinions about books too! It can be frustrating, but strangely satisfying at the same time.